WilliamBuckland is a Legacy Library. Legacy libraries are the personal libraries of famous readers, entered by LibraryThing members from the Legacy Libraries group. » William Buckland's legacy profile. WilliamBuckland is also an author. About meWilliam Buckland (1734-1774), architect. Born in Oxford, England, Buckland apprenticed with his uncle James Buckland in London. William came to Virginia at the age of 21 as an indentured servant to Thomson Mason, brother of George Mason IV. George Mason hired Buckland to complete the interior of his estate, Gunston Hall, which Buckland did from c. 1755 through 1759. 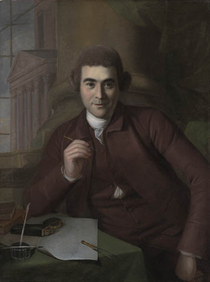 Buckland was known for his interior designs, and his other Virginia works include Mount Airy (1761-64), Richmond County Prison (1763) and workhouse (1767), Landon Carter's Sabine Hall and Robert Wormeley Carter's house (1766). Buckland moved to Annapolis, MD in 1771, and there was commissioned to design the Chase-Lloyd House (1771) and the Hammond House, which was uncompleted at the time of Buckland's death. About my libraryBuckland's library is drawn from his estate inventory (PDF), digitized by staff at Gunston Hall. The inventory was taken at Anne Arundel County, MD, on 19 December 1774. Thanks to Michele Lee, Librarian & Archivist at Gunston Hall, for making information about Buckland and his library available for addition to LT.